We, at WITI are very sad to announce the passing of a great pioneering woman, honored at the WITI Hall of Fame as one of the World's First Programmers, and good friend to WITI, Kathleen Antonelli. Her spirit will always live as a source of inspiration for all of us. For more information, please visit her guestbook. WITI will be launching our new magazine WITI Savvy very soon. Please make sure we have your correct info by logging in here: www.witi.com/users. For advertising information click here. Thank you! Reserve your room today at the WITI Las Vegas Conference Hotel, The Aladdin Resort and Casino, before rates go higher. Click here to find out more. I have always loved to read. My love of reading started when I was in elementary school. My parents would not allow a television in our home until, when I was about 16, a couple of my brothers bought them one as a gift. Until then, I spent countless hours reading at home and at the local library. I loved the librarians - they were kind, intelligent and helpful - just like my mother. We think we have no choices about how we spend our time. Technology that was supposed to make life easier has actually done the opposite and is eating away at our personal time. Personal Digital Assistants (PDAs), computers, email, cell phones and pagers all compete for our attention. Electronic organizers and communication devices create an "on-call" work mentality that takes priority over personal responsibilities. Lack of time is more perception than reality. Looking to show your support of women pursuing a profession in technology? Here's an opportunity to establish and reinforce your company's reputation as a leading employer of women in your industry. Maureen Crawford Hentz, the Diversity Recruiter at Osram Sylvania since October 2005, is now the Manager of Talent Acquisition. Maureen is interested in networking with women in WITI particularly on issues related to work/life balance, (G)LBT issues and issues related to disability. Maureen writes regularly for the Boston Works HR blog and for quintcareers.com. 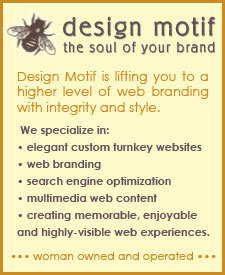 Design Motif, lifting you to a higher level of web branding with integrity and style. We specialize in elegant custom turnkey websites, web branding and search engine optimization, creating memorable, enjoyable and highly-visible web experiences.